After we arrived at New Haven Yacht Club, we released the mooring ball at 848am, but had to turn back and wait to return the line that Christina had given us to tie up to the mooring ball. We had it on the combing, so soon we on our way again at 9am. 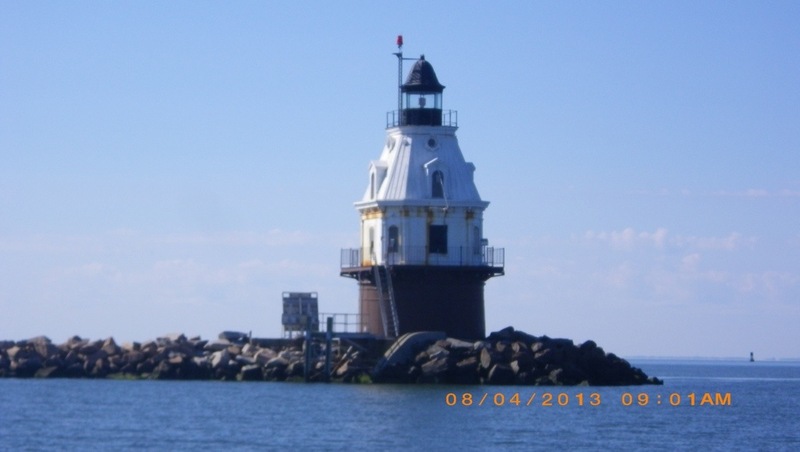 We passed the lighthouse to New Haven Harbor at 920 am. Phil let put the head sail once we cleared the harbor, bit that didn’t last for long as we left the wind line. Phil was kind enough to be at the helm the entire trip while I worked on catching up on the blog before we spent time with Phil’s old college buddy, Chet. By 1230pm we were entering Westbrook Channel to arrive at Brewers Point Pilot Marina gas dock.
. Boy was it busy in the channel! We had to go past the gas dock and do a U-turn the first time as there was a sailboat taking up most of the dock, then we had to go around again ad a small motor boat snuck in and needed to be moved. I yelled out that we wanted to come in, so they saved room for us. Once there, hugs went around and Phil and Chet went i to get a dock assignment. 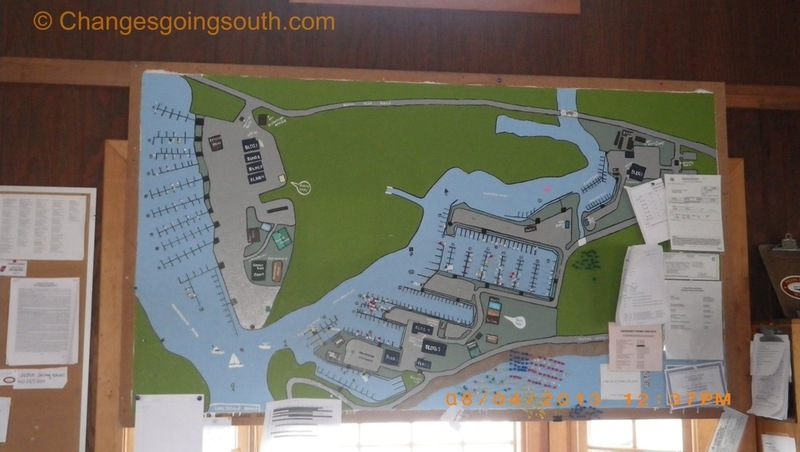 They have a full size map of the marina on the wall and we were placed in the North Yard on the same dock as Chet and Carol. Docking the boat wasn’t easy either due to wind and current and having to change our dock location at the last minute. But Phil did dock the boat without hitting anyone, though there was only 1 foot clearance between us and the slip mate boat. After securing the boat, we gathered together items we needed for a two- day stay with Chet and Carol. It was a beautiful drive to their home and they have a very nice home near the top of a mountain which gives Chet the added height for his two tall Ham Radio towers. Connecticut has lots of hills, stones, rocks, and boulders and green trees. They’ve had so much rain, that the grass is green instead of the normal brown grass of summer. We enjoyed getting together, dinner and the to bed not too late tonight. 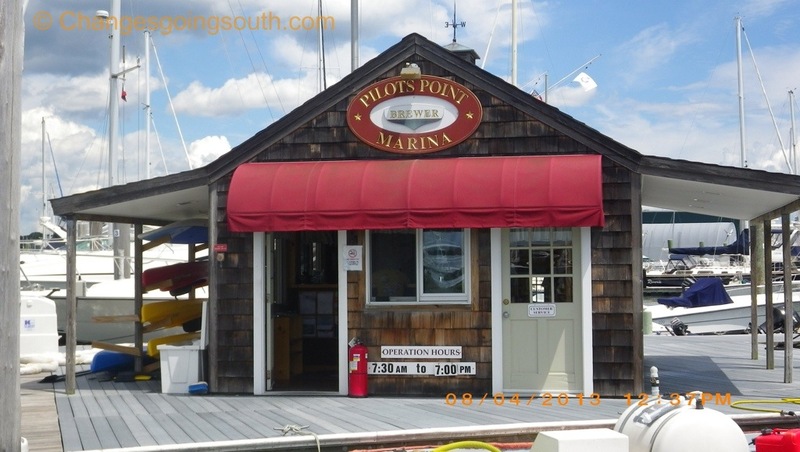 This entry was posted in 2013, Connecticut, Cruising Friends, Long Island Sound, Marinas and tagged Brewer Marinas, Cruising friends, layover. Bookmark the permalink.